Stopwatches or Sniffers or Sensors or Cameras? It’s a weird thing. Airports seem to be going to the market saying, “I want to buy some queue measurement sensors” and sometimes even specifying what type of sensor they’re looking for. The trend for defining sensor types (the how) rather than the outcomes, insights, analytics and data they need (the why and what) drives some of us crazy. But it’s a scene that’s out there so we have to engage with it. Here’s a CrowdVision view. We believe you should choose your sensor(s) to match the problem you’re trying to solve and the data you need. • Sometimes – if you just need small amounts of one-off data – a stopwatch may be just fine. 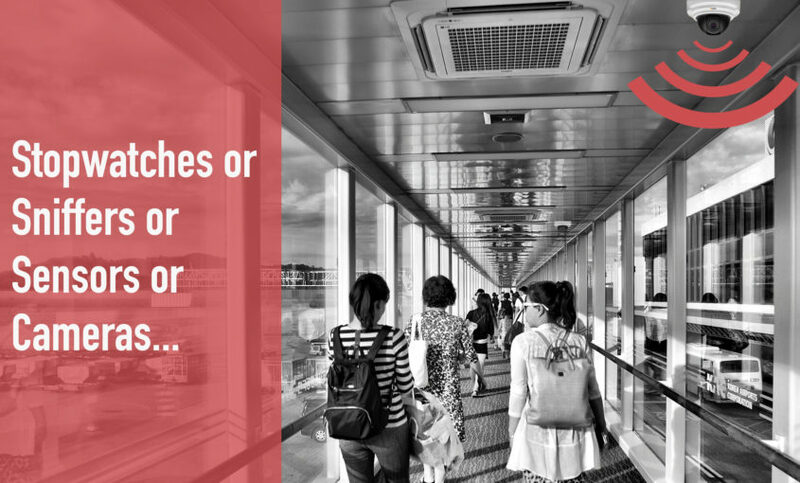 • Sometimes – if you just want to measure people in an out of a location – its fine to use doorway counters. • Sometimes – if you just want to know how long people are taking to get from A to B or their dwell times – its OK to interpolate from samples of detections from WiFi sniffers. • Sometimes – if all you want to measure is people in queues – its fine to use stereoscopic (or “3D”) depth sensors or LIDAR. • But if want to measure everything, everyone, everywhere, in real-time then IP cameras offer the most capable sensor. Why do we like the ‘camera as a sensor’? A standard IP camera provides the computer vision developer with the most amazing array of options for extracting data from a scene. By applying computer vision algorithms to video streams, we are not constrained to measuring depth but can also detect and extract colours and textures and shapes – and track changes in all of these second by second. That’s why, when we founded CrowdVision, we selected the standard video camera as our preferred sensor and set about developing the data extraction and analytics capabilities we have today. The other great thing about IP cameras is that they continually improve in optical capability and features, with big name brands like Axis and Bosch, as well as many excellent Asian companies, investing billions of dollars into continuous innovation each year. By leveraging this, CrowdVision’s own product development can focus on the clever computer vision, AI, learning and analytic algorithms rather than reinventing the wheel. Our customers love the fact that they can buy the sensors needed for a CrowdVision deployment with the click of a mouse from a mainstream supplier, that they are reliable and well-supported, and do not create a proprietary technology dependency risk. Customers also like the fact that one camera, which aligns with their current estate and which costs only a few hundred dollars can deliver any pedestrian analytics you need – occupancies, heatmaps, flows, queue times, transaction times, asset staffing levels, asset utilisations and many more. None of the other sensor options come near this richness unless they are combined with or leverage other compensating technologies. Throw wide angle/fisheye lenses into the mix and each camera can see a very long way, meaning fewer sensors and lower hardware, installation and support costs. The same cameras can be mounted in ceilings or on pillars, from low positions to very high ones, and can generate the same robustly accurate metrics and analytics in almost any environmental or operational scenarios. So, what’s not to like about the camera as a sensor? In some communities, the “camera as a sensor” has not been well understood as something different from the “camera for surveillance”. When a camera is used as a sensor, there is no need to record or store any video. A sequence of video frames can instead be processed in real-time to extract data without saving video. This means that the “camera as a sensor” model is a privacy-compliant solution, far less invasive than solutions that rely on identifying or tagging or tracking people. Another concern has been around the need to have video running over airport networks (from cameras to servers) and this can be a real issue in bandwidth limited locations. That is why we have enhanced CrowdVision so that it can now be run in an Edge Processing mode, meaning video no longer needs to flow anywhere. For us, the most compelling thing about the IP camera as a sensor is where this journey will go next. Forward-leaning airports are beginning to embrace the concept of one video infrastructure for multiple purposes. As long as this intent is clear early on and procurement is coherent, there is no reason why an airport shouldn’t invest in cameras and cables once and reap the benefits of computer vision applications for many different use cases, over many years. Each camera will serve one or more users with key imagery or analytics, covering security, safety, operational and commercial use cases, all managed efficiently as one high-value integrated sensing network. CrowdVision is now part of this ecosystem and has integrated with some of the world’s leading Video Management Solution providers. We will never argue there isn’t value in other sensors types, especially for some use cases. Indeed, we ourselves are invested in bringing data from different sensor types together for richer insights. However, we firmly believe that a real-time measurement solution built around a network of IP cameras and the CrowdVision analytics platform is the most capable, flexible, scalable and future-proof fit there is. If you’d like to see it for yourself, please contact us.